Andrew joined the Tulip Board in 2007 as Agriculture Director and became Managing Director of Dalehead Foods in December 2017. He began his career in practical pig production after studying at Agriculture College. He then joined Associated British Foods and established BQP, adding an abattoir/processing division before the business joined Dalehead Foods in 2000. Andrew is responsible for BQP’s pig production business covering 350 farms in East Anglia, South West and Midlands covering all aspects from grain supply to the abattoir, through to customers. He is responsible for purchasing of all pigs from farms to meet Tulip requirements. 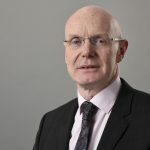 He was a member of the AHDB Pork board for 15 years until this year, and is also chair of British Meat Processors Association’s Pigmeat Committee. He is also chair of British Meat Processors Association (BMPA) Pigmeat Committee and a member of the BMPA Council. He is the chair of a Group of 15 suppliers/processors covering all areas of Primary Protein (including beef, pork, lamb, milk, organic milk, duck, broiler chicken, turkey, eggs and fish) reviewing the opportunities for supply chain cooperation and adding value from on farm standards to marketing opportunities. Andrew is also a member of Danish Crown Pig Supply Group reviewing farm standards, key issues in the supply chains, sourcing strategy and purchasing options.